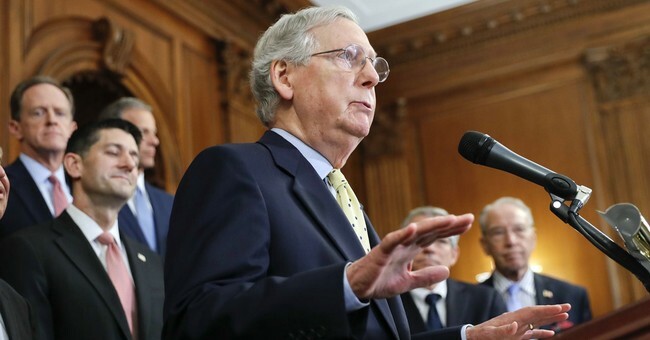 Despite the unrequited longings of the left and certain vocal Republicans, there is no civil war in the Republican Party, and there is not even widespread disaffection with President Donald Trump among rank-and-file GOP voters. But this is not what you would assume listening to Democrats and the mainstream media or frequenting the Twitter accounts of a number of high-profile Trump-disdaining conservatives. Sen. John McCain has been in a public feud with President Trump, as have Sens. Bob Corker and Jeff Flake, who both have announced that they will retire, lamenting the decline in dignity and manners that Trump has allegedly ushered in. And no less a Republican well-wisher than Hillary Clinton has declared that the GOP is imploding. President Trump, for his part, obviously perceives matters differently, tweeting, "The meeting with Republican Senators yesterday, outside of Flake and Corker, was a love fest." Even sometime Trump critic Lindsey Graham praised the luncheon, saying that Trump was "upbeat," "lighthearted" and "funny as hell." With the liberal media gleefully showcasing these intramural squabbles and obsessing over Trump's every tweet and phone call, it's no wonder some might infer that Republicans are in hopeless disarray and headed for extinction. But outside their echo chamber and that of the denizens of NeverTrumpistan, I think we'll be fine. Victor Davis Hanson, in a piece for National Review Online, cited data showing that despite perceptions to the contrary, Trump received roughly the same percentage of Republican votes as other previous GOP presidential candidates. Additionally, my own experience tells me that the overwhelming majority of fellow Republicans and conservatives are supportive of Trump, even if they don't wholeheartedly embrace everything he may tweet or say. Indeed, very few conservatives I've run into are that concerned about Trump's tweets -- even those who would prefer he dial them down a notch -- because they appreciate that he is speaking their language instead of the guarded language of the typical politician. Columnist Salena Zito offered a fascinating insight on this, saying, "The press takes him literally, but not seriously; his supporters take him seriously, but not literally." Though certain conservative Trump critics cringe at this, I dare say the rank-and-file Republican voter understands the difference and isn't sweating the small stuff -- provided we can move forward on policy and dismantle the Obama agenda. Trump supporters don't dispute that Trump's bombastic style provides fodder for his critics, but they also understand that the political left has mercilessly savaged every other Republican president for decades. They believe that Trump is the first one, at least since Ronald Reagan, who gives the left a taste of its own medicine. This may be cringe-worthy to the Emily Posts of the conservative chattering class, but many of the rest of us are willing to overlook some of the distasteful in exchange for someone in our corner fighting back. This is not to say that the Republican Party enjoys the greatest reputation these days, but that's more the fault of the recalcitrant moderates and the establishment wing than it is of Trump. Trump's most ardent conservative critics are the very ones who contributed to his rise in the first place -- partly because they didn't perceive Obama's agenda as urgently destructive or they weren't willing to oppose him vigorously enough. And let's never underestimate the level of angst generated by the open-border advocates on the right who besmirched good-faith immigration hawks as nativists and racists. It's also hard to take seriously some (and I truly mean some, not all) never-Trumpers' insistence that they are the true conservatives when you often see them obsessing over Trump, and you rarely see them criticizing the left; in fact, they frequently retweet liberals with approval. What these critics don't grasp is that the Trump movement transcends Trump. It preceded him and will survive him. This does not necessarily mean in my view that populism will replace constitutional conservatism. But it does mean that rank-and-file conservatives are tired of their politicians talking a good game during their campaigns and losing their nerve in office and will now hold their candidates accountable. As most recognize, Trump is not primarily ideological, though he does have a set of strong ideas on certain policies. I disagree with his protectionist bent, and I don't believe he should cater to the class warriors in promoting his otherwise attractive tax proposal. I also believe he could have been much more successful on Obamacare reform if he'd have tried to placate the bleeding hearts less via pre-existing conditions and mandated coverage and implement truly constructive market solutions. But I am not fretting those differences. I am trying to speak up about them and hoping in my small way to influence the movement in a conservative direction. Precisely because Trump is not a rigid ideologue, the policies of the so-called Trump movement -- with certain exceptions, such as immigration -- are not set in stone. Even on foreign policy, Trump has not shown himself to be a pure isolationist as some feared. He's a strong nationalist and patriot, but so are most constitutional conservatives. In many areas, Trump is governing as a mainstream conservative. So no, the GOP is not imploding; it is experiencing a realignment whose parameters have yet to be fully drawn, so let's quit panicking and be constructive forces to shape this movement into one that's conservative, dynamic and determined to fight the left with the same amount of energy it uses to fight us. If we do that, we have every reason to expect to hold on to our governing majority.